Chemotaxis, transmigration and invasion assays: in-vivo like setting; cells adhere from flow and transmigrate through embedded microporous membrane (2-10 μm pore sizes) into underlying microwell containing chemoattractant. Suitable for ECM-matrix, collagen gels, hydrogels, matrigel or similar aqueous gels. Cells may also be cultured in the underlying microwell with/without gel. 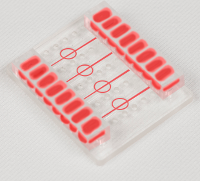 Faster than traditional chemotaxis assays due to reduced distance in microchannel format. Suitable for whole blood, primary cells, rare cells e.g. where samples are more difficult to retrieve or culture or only small sample volumes available. No luer lock connections which increase dead volume. Cellix's biochips have a unique plug & play connection with tubing connections which are autoclaveable and reuseable. Dead volume is at input port ~ 0.1μL. Applications: Chemotaxis, transmigration and invasion assays using minimal sample volumes (whole blood, cell suspensions, proteins etc. ); brightfield, phase contrast and fluorescence microscopy.